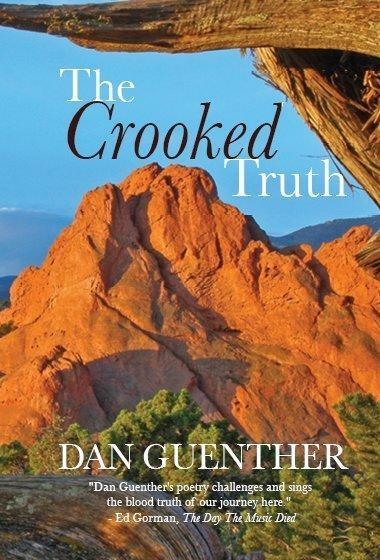 The Crooked Truth was the 2011 Colorado Authors' League Award selection for Poetry (Books). "Dan Guenther is a poet for all seasons who speaks to us through unique imagery and often brilliant contrast about his many years walking the western landscape, the old Ute trails in Colorado, foreign lands, and a war-torn country side. His deep relationship with the natural world, and all its creatures has a way of healing, making connections, and balancing one's life in the great scheme of living and dying. In silence and solitude and in secret places, from Vietnam to a winter campsite, he ponders the big questions, and we listen. His meditations on time, space and light, ancient cliff dwellers and new beginnings, awaken the poet in us. We feel his compassion and respect for all things living and dead, and are grateful when he says the child in me still believes in magic, because on each page of this fine collection, we believe with him." — Carolyn Evans Campbell, Author of The Tattooed Woman, Colorado Book Award winner. Read more about The Crooked Truth from the Colorado Authors' League. that always arrive after the thaw. our appaloosa spooked and running down Highway #93.
grateful that at least the giant trees were spared. where both Ute and Arapahoe once grazed mustang stock. and our mind shifts, devoid of any acuity or understanding. ever arrive at this late hour. while listening to the rain. giant catfish sleep as they drift downstream. his soulful face like that of a lost spirit. after the thaw, ushering in spring's divine rains. on the delicate toes of his tiny paws. as human beings, along with the ghost of a drowned child. the wild bees have all but disappeared from our valley. his head spinning with dark schemes. hidden in the density of the leaves. for the lost in the darkness of the night? the swallows will be skimming across the surface of the water. the magpies scolding me through the scrub-oaks. stretching away across the plains. left by the ancients along the Arkansas. and glimpse the otters on their muddy slick. that everything is lost with death. rode the rainy swells of the Whale's Road. guiding us to geologic domes hidden in this codless sea. and no higher plane of meaning beyond the here and now. shape-shifting spirits, or a sign from Odin. mixed in deadly crowds to sell their skills. and glistening in a haze of incense and candlelight. of a cat, of that I am confident," she snapped at me. from other galaxies who change their shape at will,"
she said, twirling, her madness quite complete. two Yanks having found and recovered his remains. offered the only path through the darkness. wearing only an enchanted cloak to cover her nakedness. beneath the Northern Lights, a promise of her return. the ones anchored in the depths of time's deep seas. of divinity which is the underlying reality of all things? the theory that all stars coalesce out of interstellar dust. of a cosmic sculptor playing upon a galactic scale? an unknown hand that holds the cosmos in its grip. that what is most often true is in the glitches. to be confirmed by the sweet blips and mishaps in our lives. feeding right up through twilight on these last, long days. living moment to moment with the crooked truth. and I drink beer with my pregnant wife. caked-hard in a dry creek-bed. these rolling hills are my woman's lap. in Gamoowea, growing like a child's new cut teeth. Call the black stump a lion's head. small boys hear it roar. with a stone, just outside Wilcannia. Whirlwinds rose from a red salient. were left in the footprint of a great truck. a thousand dolphins head south, under a full moon. Across the street the post office is full of insects. slowly waking to a child's dolphin kick. In the early morning schools of mullet move off-shore. flashes like rifle fire in the moonlit water. working your way along a massive ridge. and in places you are up to your waist in swirling fog. jutting above a green expanse. number in the hundreds, and await your discovery? The mountains looming in the west belong to Laos. To the east a plume of smoke marks a contact. a barren swath, pock-marked with water-filled craters. a lone forest antelope gallops for the safety of the trees. From Operation Oklahoma Hills, May 1969.
an animal yet to be fully described by science. that saw extensive use of Agent Orange defoliant.